Why are light bulbs changing? In 2007, Congress passed and President Bush signed into law the Energy Independence and Security Act (EISA), improving energy efficiency for many products, including light bulbs. You can still buy incandescent bulbs that look and operate like the ones you are used to—the new ones just use less energy. 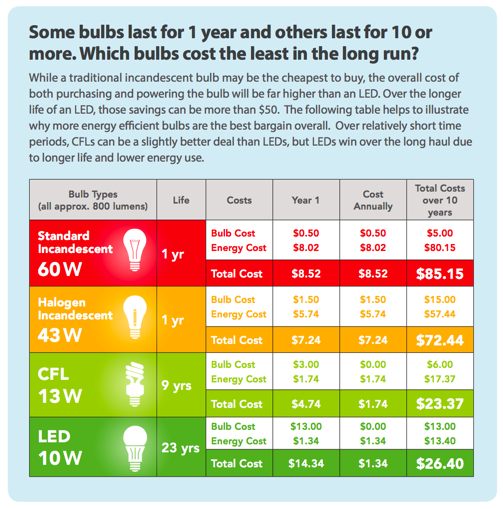 The law also requires new light bulb labels to help you choose the most efficient bulbs, like LEDs and CFLs. Incandescent bulbs produce light when an electric current passes through a filament and causes it to glow. Because they are less energy efficient than other light sources, they are best used for task lighting that demands high levels of brightness. General service incandescent bulbs are the inexpensive, readily available light bulbs that most of us think about when we hear "light bulb." They produce a warm, yellow-white light that is emitted in all directions and are available in either a clear or frosted finish. Fluorescent bulbs produce light when an electric arc passes between cathodes to excite mercury and other gases producing radiant energy, which is then converted to visible light by a phosphor coating. T8 bulbs with electronic ballasts are commonly used in larger ceiling fixtures. Because of the electronic ballasts, they turn on instantly and do not hum. They are commonly used in commercial projects and are now being widely used in residential applications. Compact Fluorescent Lamps (CFLs) are small fluorescent bulbs that can be used in most types of lighting fixtures. The screw-in types can be used to replace incandescent lamps in standard lamp sockets. High-Intensity Discharge (HID) bulbs produce light when an arc passes between cathodes in a pressurized tube, causing metallic additives to vaporize. They have long lives and are extremely energy efficient, but - with the exception of metal halides - they do not produce pleasing light colors. In residential settings, HIDs are most often used for outdoor security and area lighting. There are four types of HIDs, Metal Halide, High-Pressure Sodium, Low-Pressure Sodium & Mercury Vapor. Check to see if your LED light bulb or fixture is listed on the DLC website and might be available for your local rebate. The DLC® is a non-profit organization whose mission is to drive efficient lighting by defining quality, facilitating thought leadership, and delivering tools and resources to the lighting market through open dialogue and collaboration.